My guess is almost all amputees have had some embarrassing moments involving their prosthetic. I can’t be the only one! Falling down, an innocent child staring at it, stepping someone’s foot without realizing it…. all of those have happened to me but today the story I’m going to tell is one about my leg falling off in front of 200 people! Many people have told me when I wear long pants they had no idea I had a prosthetic leg. Sure they noticed a limp but they still thought I got around pretty well. So imagine the surprise of 200 people! I run a comedy troupe called Knock Em Dead Comedy. One of the types of entertainment we offer is audience participation comedic murder mystery shows. 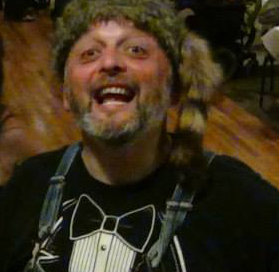 One night we were doing our Redneck Wedding murder mystery show where I was wearing overalls. In one scene I was chasing someone & I dove under a table to cut that person off as she was running on the other side of the table. Well, my prosthetic foot caught the leg of the table but I didn’t feel anything & kept going. I kept going but my leg didn’t! My stump came flying out of my socket. I flew under the table with two legs & came out on the other side of the table with one! The socket came off but was too big to fit through the bottom of my pants so my leg was dragging behind me! Now you have to understand that in my opinion a sense of humor is needed when dealing with something like amputation otherwise the disability defines you. So the first thing I see is 200 people staring at me in complete silence, just like in Back To The Future when Marty is doing that crazy guitar solo at the dance. No one knew what to make of me! Immediately I burst into laughter! Eventually, the crowd laughed as well as one of my fellow cast members tried to slide the socket back up through the pants & over my stump. It was quite the sight! This is one of my favorite memories involving my leg. Many of my blogs will be fun stories involving my leg. Hope you enjoy them!